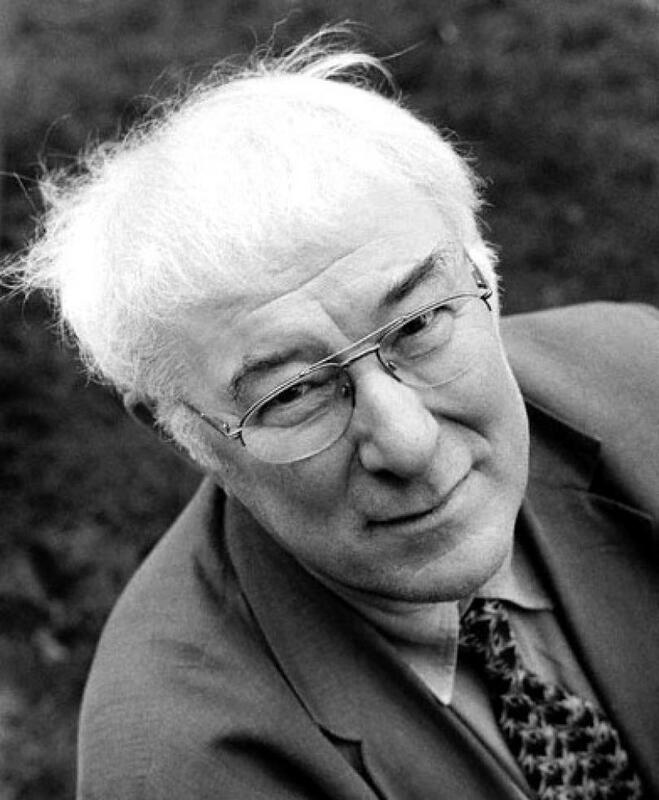 Elegy for Seamus Heaney Seamus felt it in his feet, Clods of fuel in the peat. In the peat a fire to warm Children not yet even born. Joseph Brodsky was his friend. Wystan Auden would amend Dances William Blake would like, Tigers lurking in the night. Metric feet and feet in boots – Robert Lowell was shown his roots Welcomed in an Irish town Where the sky was falling down. Mister Yeats was dead by then Honored by some mortal men Heaney his example took, Brooding sky and flying rook. Even Possum shares the beat In Joseph’s poem for Thomas Stearns. Heaney’s poem for Brodsky, dead, Lives in turns, not Grecian urns. What dread turning plow or spade Having dug up things well made Digs now to inter a shade. World poets learn your trade! 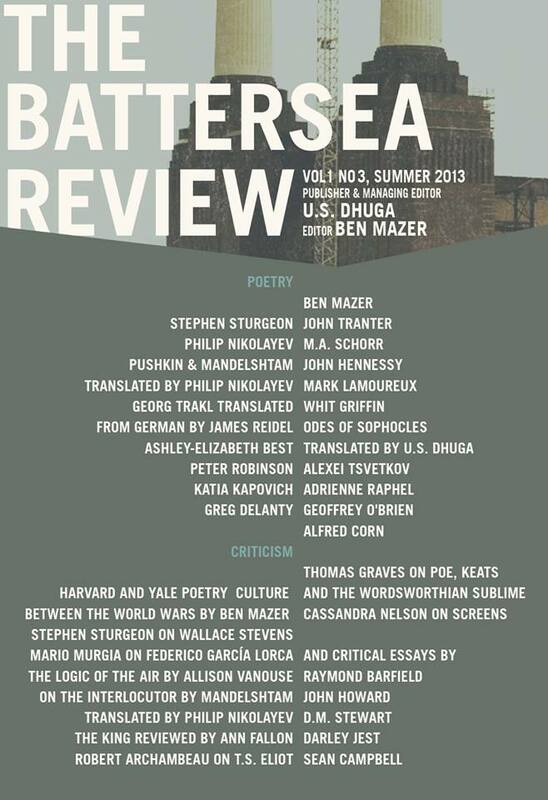 Hot news -- the new issue of the Battersea Review is out, and available online! 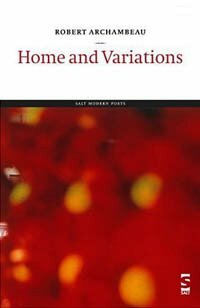 It's got poetry by John Tranter, Alfred Corn, Peter Robinson, Katia Kapovich, and many others, as well as new translations of Georg Trakl, Sophocles, Pushkin, and Mandelshtam. 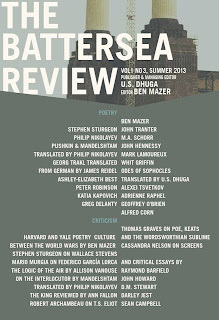 You'll also find essays on Harvard & Yale poetry culture, Wallace Stevens, Federico Garcia Lorca, Romanticism, and more -- including my essay "T.S. Eliot and the Vanishing Brahmin." Check it out! 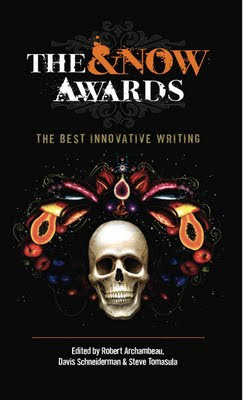 Many thanks to U.S. Dhuga and Ben Mazer for putting it all together, and for running the most intelligent and eclectic literary journal of the decade. "Noblesse oblige," wrote E.J. Dionne in the Washington Post, "sounds bad until you don't have it any more." Dionne's point was that the American elite no longer seems much interested in legitimating its position by undertaking the kind of social and cultural leadership to which earlier elites had devoted themselves. Dionne's sentiment is apt for our times, but it would have been equally germane to the America in which T.S. Eliot came of age, an America in which an old elite headquartered in Boston found itself shunted aside by a rougher sort altogether: the Carnegies and Fricks and Morgans and Rockefellers, and the equally ruthless men whose stories Lincoln Steffens told in The Shame of the Cities, men who made an art of turning public resources into private profit in the burgeoning metropolises of the nation. Eliot's class, the old Boston Brahmins, with their patrician scruples about fair dealing and community leadership and responsibility, didn't stand a chance, and their decline mattered immensely to Eliot. Indeed, the decay of Eliot's class of origin would prove crucial to his Anglophilia, his poetics, and even to his love of etymology. The first thing you notice, when you start reading the canonical literature of the generation of English writers who came of age in the 1930s, is their seeming inability to actually come of age. Everywhere one finds images of school, schoolboys, school games, school prize days. And by everywhere, I do mean everywhere. These images aren't confined to memoirs of childhood, though there are plenty of those: they're used even to describe the most pressing problems of a world entering a state of deep political and economic crisis. Could any other generation have produced something like Auden's Orators, where the state of the world is just the state of the English public school writ large? One kind of explanation for the schoolboy poetic comes when we see the remarkable similarity of background of the prominent writers of the generation. W.H. Auden, Cyril Connolly, Stephen Spender, John Betjeman, Edward Upward, Cecil Day Lewis, Christopher Isherwood, Louis MacNeice, Evelyn Waugh, Graham Greene, George Orwell, Anthony Powell—the only real difference in their educational background (besides Orwell's refusal to go on to Oxbridge) was the degree of prestige associated with their respective public schools in the subtle hierarchy of English education. Not one was a grammar school boy. This, it should be noted, is an unusual state of affairs in English literature, one without precedent, and one not repeated in later generations. Consider the prominent writers active in England 1915, while the writers named above were still in school. 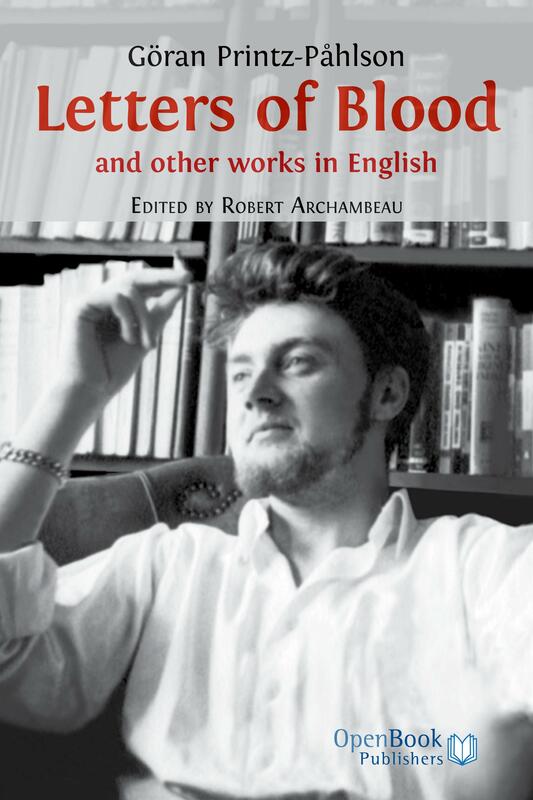 Yeats, Conrad, Shaw, Joyce, Woolf, D.H. Lawrence, Wyndham Lewis, Pound, Eliot, H.G. Wells, Kipling—a few went to English public schools (Ford, Kipling, Lewis for a time), but some (Conrad, Yeats, Pound, Eliot) were foreigners, others were from humbler backgrounds (notably Wells and Lawrence), some were both (Shaw, Joyce) and Woolf was excluded by gender from the schoolboy experience. Consider the prominent writers in England today, and the diversity is all the more striking. Why, one wonders, was there such a concentration of public school old boys in the literary generation of the 1930s? What drove them to become writers at a higher rate than previous generations from similar backgrounds? Here we enter the realm of speculation. My sense of things is that there may be something akin to the nineteenth century Parisian phenomenon at work. For much of the nineteenth century in France, the social and educational system produced far too much talent for the social system to absorb. Respectable professions such as the law, the clergy, finance, and politics couldn't take on all of the bright young men seeking places, and this contributed to the enormous growth in the field of culture—writing, the arts, and the bohemia that came along with them. In the England of the 1930s, the generation of public schoolboys faced a destroyed economy and much-reduced prospects. They were deprived of the areas of action and fulfillment available to previous generations with similar backgrounds. Along with this displacement came a sense of alienation from the ideology of leadership and service with which they had been instilled. 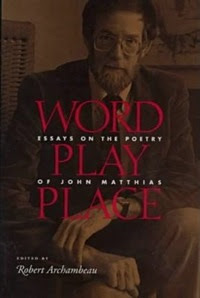 They had, then, both motive and opportunity (or, shall we say, lack of opportunity) enough to become writers: critical of their time, needing to rethink the relation of self and society, equipped with exquisite educations, and unable to get traction in fields of social leadership, they took up their pens. Of course there were many English writers of the time who did not come from the same sorts of school background as the Audens and Isherwoods. What of them? What of Julian Symons, Christopher Caudwell, Derek Savage, George Barker, and a host of others? One could make an argument along the lines of "well, they weren't as good, were they?" but this would be highly contentious. Read a few George Barker poems side by side with some of Spender's and tell me the case for the superiority of the public schoolboy remains clear. A more convincing case could be made for the relative lack of social capital among the non-public school set. That is: even though they may have been denied the easy entry into positions of security and authority that they had thought their birthright, the public schoolboys were still as a whole better connected socially, more financially secure, less burdened by family obligations, and held more impressive academic credentials than their peers from humbler backgrounds. 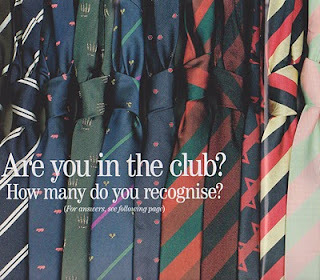 Moreover, they had formed very close bonds with their peers at school—one of the main functions of prestigious boarding schools, and one that ensured the career-building value of the old school tie. This gave them a stronger starting position in the race for literary reputation. I cherish the works of Auden, I read the works of Isherwood with a hearty appetite, I ransack Spender's journals for gems of gossip and social observation. But I try not to forget that both the achievement and the prominence of those writers rests on a bedrock of privilege, albeit of privilege displaced from the realm of power to the realm of art. John Steinbeck was a whiz in front of a typewriter, but don't ever let him don the paper cap of a fry cook. And keep Hemingway away from your camp stove, people. Your whiskey too—but that's another story, and one we've heard told many times. He presses down a hissing hamburger with his spatula. He lays the split buns on the plate to toast and heat. He gathers up stray onions from the plate and heaps them on the meat and presses them in with the spatula. 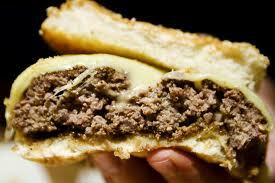 He puts half the bun on top of the meat, paints the other half with melted butter, with thin pickle relish. Holding the bun on the meat, he slips the spatula under the thin pad of meat, flips it over, lays the buttered half on top, and drops the hamburger on a small plate. Quarter of a dill pickle, two black olives beside the sandwich… And he scrapes his griddle with the spatula and looks moodily at the stew kettle. ...other than the guy cooking them has seen other guys doing it. Also, there are cooks who like to play with the food while it's cooking -- like busy work (a corollary to this are people who stir the pot too much). It's hard for some people to just step back and watch the magic happen by itself. There's the sad truth of it. I imagine gender comes into play, and that there's some kind of male tool-handling impulse underway that only Freud could explain, but until my research grant comes in, I just don't have enough ground round stored away to put the theory to a statistically valid test. In Monterey before he even started, he felt hungry and stopped at Herman’s for a hamburger and beer. While he ate his sandwich and sipped his beer, a bit of conversation came back to him. Blaisedell, the poet, had said to him, “You love beer so much. I’ll bet some day you’ll go in and order a beer milk shake.” It was a simple piece of foolery but it had bothered Doc ever since. He wondered what a beer milk shake would taste like. The idea gagged him a bit but he couldn’t let it alone. It cropped up every time he had a glass of beer. Would it curdle like milk? Would you add sugar? It was like a shrimp ice cream. Once the thing got into your head you couldn’t forget it. He finished his sandwich and paid Herman. He purposely didn’t look at the milk shake machines lined up so shiny against the back wall. If a man ordered a beer milk shake, he thought, he’d better do it in a town where he wasn’t known. But then, a man with a beard, ordering a beer milk shake in a town where he wasn’t known — they might call the police. I mean, given the monumental lack of judgment here, we're lucky Steinbeck didn't advocate squishing those hamburgers with a shoe. Fans of Steinbeck may take courage from the fact that he was not alone in his culinary ineptitude. Consider an even greater writer, Ernest Hemingway. While Hem was rightly considered something of a bon vivant, and could rhapsodize about the comestible delights of Italy and France, when he moves from being a diner to depicting the act of cookery itself, he stumbles from the sublime heights of Paris to the degraded depths of the canned food aisle. Nick was hungry. He did not believe he had ever been hungrier He opened and emptied a can at pork and beans and a can of spaghetti into the frying pan. "I've got a right to eat this kind of stuff, if I'm willing to carry it,” Nick said.His voice sounded strange in the darkening woods. He did not speak again. He started a fire with some chunks of pine he got with the ax from a stump. Over the fire he stuck a wire grill, pushing the tour legs down into the ground with his boot. Nick put the frying pan and a can of spaghetti on the grill over the flames. He was hungrier. The beans and spaghetti warmed. Nick stirred them sad mixed them together. They began to bubble, making little bubbles that rose with difficulty to the surface- There was a good smell. Nick got out a bottle of tomato catchup and cut four slices of bread. The little bubbles were coming faster now. Nick sat down beside the fire and lifted the frying pan off. He poured about half the contents out into the tin plate. It spread slowly on the plate. Nick knew it was too hot. He poured on some tomato catchup. He knew the beans and spaghetti were still too hot. He looked at the fire, then at the tent, he was not going to spoil it all by burning his tongue. For years he had never enjoyed fried bananas because he had never been able to wait for them to cool. His tongue was very sensitive. He was very hungry. Across the river in the swamp, in the almost dark, he saw a mist rising. He looked at the tent once more. All right. He took a full spoonful from the plate. "Chrise," Nick said, "Geezus Chrise," he said happily. The writing here is really quite wonderful. We get, of course, the characteristic rhythm of Hemingway’s sentences in their syntactically parallel style, and that great “Geezus Chrise” grin. And we also get that zooming out into the eerie, almost sublime woods, large with a darkness that wraps itself around Nick’s echoing voice, and then the retreat to the little, cozy heimlich world of the campfire—a movement reflecting Nick’s own life-journey into war and, imperfectly, back home again. But in inverse proportion to the glory of the writing is the food. I mean, let’s be perfectly clear about this: the dish over which Nick Adams rhapsodizes, for which he invokes the name of God, is a can of spaghetti mixed with a can of pork and beans and poured over ketchup. Had the narrative called upon us to pronounce heavy judgment upon Nick here, even to discard the sympathy for him that Hemingway has painfully cultivated in us, one could bear it. As it stands, one is just a little bit shattered. The only plausible beverage pairing for such a vexation to gastronomy is, of course, a beer milkshake. But if I see you order one, I’m calling the police. Good news! 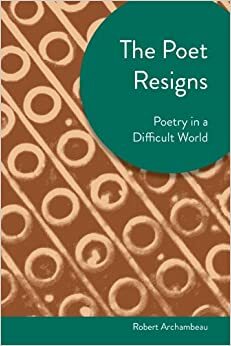 My book The Poet Resigns: Poetry in a Difficult World is more available than ever — if you have access to Project Muse through, say, your local university library's site, you can download the whole thing, or any individual chapters, as free pdfs. Also, you can get the print version on sale at Amazon for about thirteen bucks. Since the thing weighs in at 323 pages, you can't afford not to get your hands on it! What are we really wishing for when we want poetry to have the prominence it had in the past? 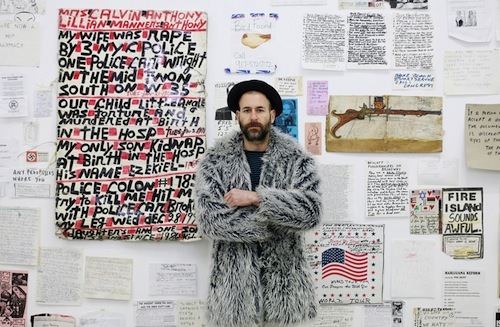 Why do American poets overwhelmingly identify with the political left? How do poems communicate? Is there an essential link between formal experimentation and political radicalism? 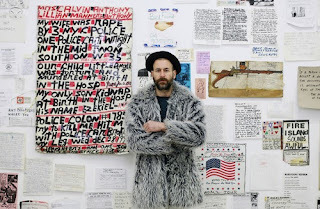 What happens when poetic outsiders become academic insiders? Just what makes a poem a poem? If a poet gives up on her art, what reasons could she find for coming back to poetry? 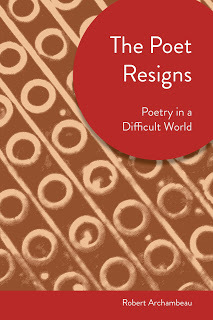 These are the large questions animating the essays of The Poet Resigns: Essays on Poetry in a Difficult Time, a book that sets out to survey not only the state of contemporary poetry, but also the poet's relationship to politics, society, and literary criticism. In addition to pursuing these topics, The Poet Resigns peers into the role of the critic and the manifesto, the nature of wit, the poetics of play, and the persistence of modernism, while providing detailed readings of poets as diverse as Harryette Mullen and Yvor Winters, George Oppen and Robert Pinsky, Pablo Neruda and C.S. Giscombe. Behind it all is a sense of poetry not just as an academic area of study, but also as a lived experience and a way of understanding. 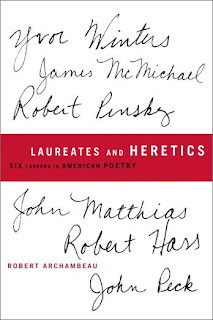 Few books of poetry criticism show such range - yet the core questions remain clear: what is this thing we love and call 'poetry,' and what is its consequence in the world? Those of you looking to download just a chapter or two might want to have a look at an earlier post in which I wrote a sentence or two on each of them. Project Muse, if you're lucky enough to have access to it, is a great source not just for scholarly articles, but for books. 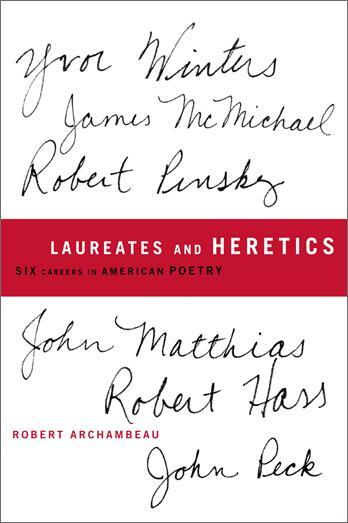 You can also download my 2010 book Laureates and Heretics: Six Careers in American Poetry there (or buy an actual book for eighteen bucks). 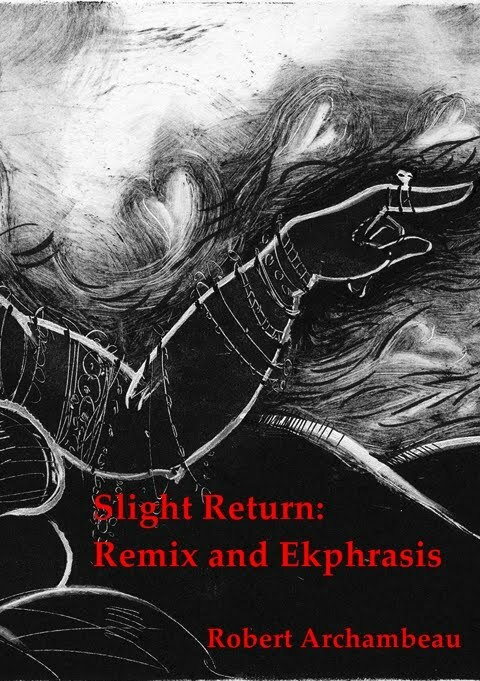 And, since I'm in full-on self promotion mode, I might also mention that you can now download Slight Return: Remix and Ekphrasis, one of my collections of poems, for free too — even if you don't have Project Muse. Among other things, it includes the prose poem sequence "The Kafka Sutra," with amazing illustrations by printmaker Sarah Conner.